We celebrate the prestigious Museum of the Year accolade with a giant mural on the wall by a Clerkenwell artist. We’ve commissioned a mural by local street artist Atma Art to mark being the only central London museum shortlisted for the biggest museum prize in the world – the Art Fund Museum of the Year Award 2018. Atma Art – whose real name is Matt Dufour – is based just a stone’s throw away from The Postal Museum on Grays Inn Road. He started to work on the impressive painting on 25 June ahead of the announcement of the Museum of the Year 2018 winner at a ceremony at the V&A Museum on 5 July. Dufour’s recent work includes commissions by Bleeding Heart Restaurants and Hatton Garden BID for Clerkenwell Design Week 2018, as well as Google’s French headquarters in Paris. 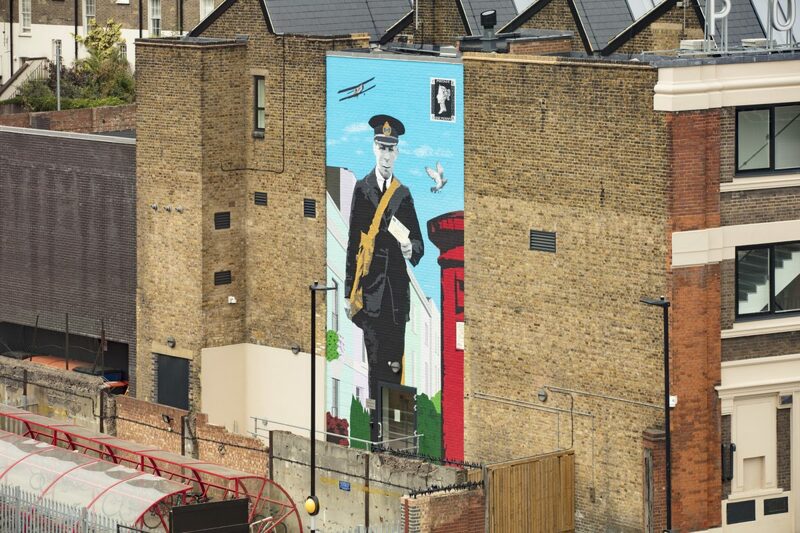 Located on the south façade of The Postal Museum on Phoenix Place, the wall painting draws inspiration from the museum’s collections and is based on an iconic image of a postman out on delivery in the 1930s. Laura Wright, CEO at The Postal Museum, said: “We are absolutely thrilled to be one of just five UK Art Fund Museum of the Year finalists. We are celebrating this huge achievement with an ambitious and beautiful artwork created by local artist Matt Dufour. Matt Dufour, Atma Art said: “As a huge fan of museums, I am so honoured to be working on this unique project. I was completely blown away by the surprising story of the British post when I visited the museum. The postal service was a true pioneer, which experimented and came up with loads of inventive solutions – such as the amazing Mail Rail network. This rich history has heavily inspired the mural I designed.